Swim (10:37): The swim was 825 yards in a 25 yard pool. Unlike the serpentine swims I have done in the past, this one was all back and forth with two swimmers per lane. I asked my swim lane buddy what he was planning on swimming and he said 10:30. It seemed like a reasonable pace so I planned on just letting him lead. We hoped in the water and before you knew it our heat had started. I was good lengths ahead of him swimmer for a couple of laps, but I wasn't going significantly faster, so I just dropped off and let him lead. I did have to play catch for half a length after each turn but it was no big deal. We exited the swim in about 10:20 and it was clear there were many others who swam faster than me. Bike (27:55): I knew I would have to win the race on the bike. Minus the 26.2 miles at Ironman St. George, I had not run a single mile in 20 days and I had no confidence in my run. The course had potential to be fast, but a 3-lap, 12 mile course over bumpy roads, with lots of turns and other distractions really slowed things down. I got on the bike and focused on catching up to people. I figured I was 10 spots down and with the other waves on the course I knew it would be tough to spot who was actually in my wave. Regardless, I focused on pushing out the power and moving up the ranks. After 2.5 laps I caught up to the leaders but didn't know it at the time. The three of us rolled into transition and I was the first one out. 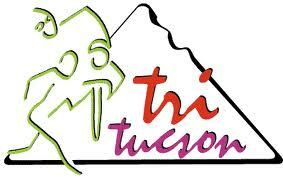 Run (18:05): The run is a flat, 2-loop, 3-mile course thru the University of Arizona campus. I focused on quick turnover of the legs as I raced down the streets and to the start of the loop. The course had good vantage points for viewing the competition, but I was running too hard and the wave start of the race made it difficult to detect if there was anyone. 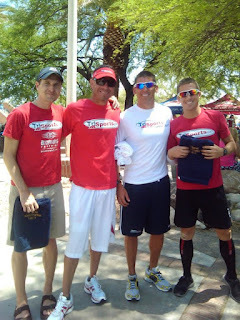 I saw the head of marketing at Trisports, and asked her if I was in 1st. It was all a blur as I just focused on moving as fast possible. For the record I had not done any speed work in over a month and going fast was sending my HR and breathing thru the roof. I was struggling, but as I continued on, I gained the confidence that I was in 1st place. Coming down the finish line I could hear the voice of Tom Demerly bringing me. I was relieved to be able to finish this training day in 1st place. Overall (56:37): I didn't quite no what to expect but it was a good day back at training. You can never be disappointed with a race win no matter how big or small the field is.